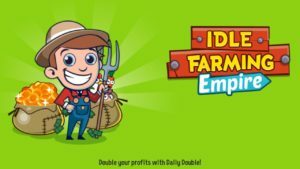 Idle Farming Empire is among top best Idle games for Android and iOS. This farming simulator game features hundreds of crops and animals and your goal is to unlock all. But this task is not easy, because, you need a huge amount of gold coins in Idle Farming Empire to unlock all these slots. In this post, we have covered some Idle Farming Empire cheats tips, and tricks for you and using these cheats tips, you can easily progress fast. Before we continue to Idle Farming Empire tips cheats, let’s start the guide/basic first. As usual, Idle Farming Empire game starts with a tutorial in which you learn about the basic Idle gameplay; how to plant crops, upgrade their levels, add more animals to slots, about boosters, and much more. After the tutorial, the player manually handles all the tasks. You just have to follow the above-mentioned process in Idle Farming Empire, that’s it. And as you know, the initial upgrades are very cheap in comparison to the later upgrades. And to buy 8th, 9th slot, you need a huge amount of Idle gold coins. It is obvious that you have to work hard to collect such a big amount of gold coins. Let’s start the Idle Farming Empire cheats tips and tricks to earn free gold coins, double your income, and unlock all slots easily. The first Idle Farming Empire tip is automating the whole work. You can not tap and tap on the screen for a long time to harvest crops or to collect the gold coins. Another reason behind automating the work is when you leave the game, you will earn continuously. On the other hand, if you have not automated the work, you have to manually tap on the crops and animals to collect profit/gold coins. To automate the work, you have to buy a specific upgrade for the specific crop or animal. To get this upgrade, you have to level-up that specific crop or animal. Once you reach that milestone, go to upgrade section and confirm. In short, whenever you buy a slot, upgrade its level and unlock the automated upgrade. Buy the upgrade in exchange for gold coins and earn continuously even when you are offline. Automate the production of crops, upgrade the levels of that crop from which you get instant gold coins, and the look for further upgrades; cut all production times, 3* profit, and more. Another one of the best Idle Farming tips cheats is unlocking the prestige feature as fast as you can. This feature unlocks after you buy the 6th slot. The main reason behind this tips is you will be able to maximize all the profit from your crops and animals without watching ads or in exchange for real money or diamonds. Using market feature or prestige feature, you will get seeds. Once you unlock this feature, tap on it and sell your all crops to market. This will give you seeds. Seed is one of the rare items in Idle Farming Empire game. You can use seeds in many types of upgrades; all profit 3*, 4*, 5*, instant delivery of 50 pigs, and much more. However, after using this feature in Idle Farming Empire, you have to plant the crops again. Before you start, go to the upgrade section -> seeds -> buy the upgrade(all profits 3*) or more. This will increase your profit from the crops and animals and you will be able to buy more slots fast. In short, market or prestige feature is worth trying. In Idle Farming Empire game, diamond is another one of the rare items and can be obtained by completing the achievements. You can use diamonds to get a huge amount of gold coins. You will be able to collect more than 200 diamonds for free in Idle Farming Empire at the 5th slot. Use these diamonds to skip the time and earn a huge amount of gold coins instantly. You can do it two times(free, without purchasing, at the beginning). Use this huge amount of gold coins in buying the 6th slot. After it, use the prestige feature and get seeds. Use seeds to boost up the profit. One of the best ways to collect diamonds in Idle Farming Empire game is completing the goals. Tap on the quest option and there you can check your daily goals. Complete these goals and earn free diamonds. Complete 9 goals and activate the rainbow to boost up the profit.